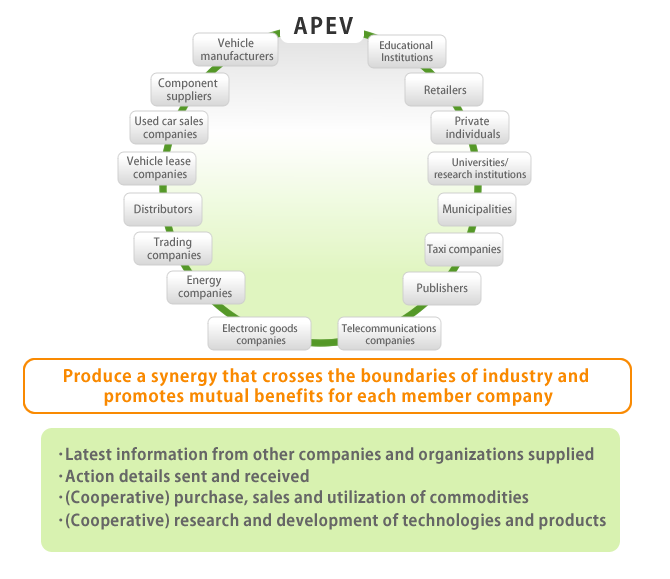 With the APEV taking a central role, we will form a collective of organizations, businesses and individuals who truly aspire to realize the electric vehicle business and aim for a system with the power to deliver. 1. Information sharing: construct a community for the cooperation of industry, government and academia and go on to produce high value-added information. 2. 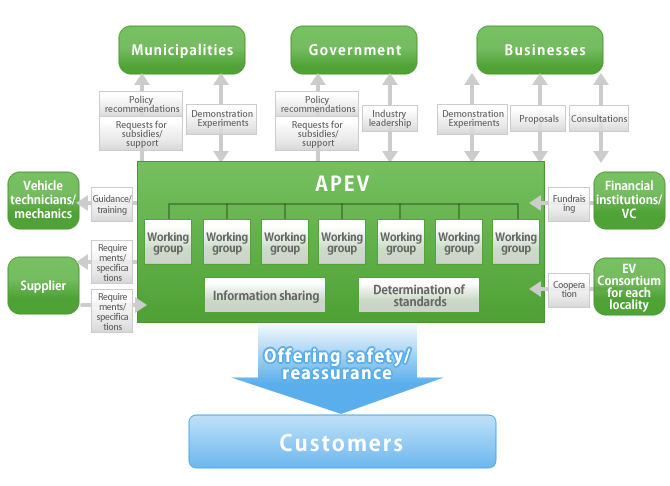 Proposal of specifications/promotion of standardization: establish standards proposed by the APEV, and contribute to the improvement of reliability and safety in the industry. 3. Technical training: conduct training for EV related persons, including vehicle technicians and mechanics, in educational institutions and businesses (provision of dispatch instructors, guidance, lectures, seminars and training, etc.). 4. Policy recommendations: approach government, municipalities, and businesses. 5. Demonstration Experiments: cooperate with municipalities and enterprises to develop lifestyles and towns in which electric vehicles are present. 6. Fundraising: coordinate with financial institutions and venture capital to provide support for businesses that wish to invest in or enter the electric vehicle industry. 7. Collaborative purchasing/sales: collate the needs of participants, attempt uniform lot purchases of high-quality components at a lower price and aim to streamline the procurement of each company.